Sextet (3 tracks): Doug Walter (alt/sop); Barry Coates (gtr); Jeff Colella (pno); Gabe Davis (bs); Scott Breadman (perc); Jerry Kalaf (dms). Trio (3 tracks): Leonard Thompson (pno); Ryan McGillicuddy (bs); Kalaf (dms). Trio (2 tracks): Rich Ruttenberg (pno); Domenic Genova (bs); Kalaf (dms). Music For Trio & Sextet is the subtitle of this enjoyable album featuring the compositions of drummer Kalaf. Kalaf states, "My approach to composing can be termed absolute rather than programmatic. In other words, I usually don't draw from sources outside the music. I don't have a specific subject matter or imagery in mind; rather, I'm concerned with melody, harmony and rhythm. I often think of the names only after the piece is written." I like it. Programmatic music is all very well but say you play a subject matter piece to a 100 people without giving them the title and I betcha you'd get 100 different answers! Recorded in Los Angeles, the septet sides have the cool quality of some of the legendary West Coastt groups of the fifties albeit with a contemporary edge reflecting today's jazz. One of our regular readers, Ron Ainsborough, will be pleased to know that melody, harmony and rhythm are indeed at the core of the music as we, along with Jerry Kalaf, agree it should be. The trio sides are equally appealing. Thompson is perhaps the more middle of the road of the two pianists with Ruttenberg taking the Bill Evans' scenic route. This One's For Jim (Hall) is a worthy tribute to the guitar legend with Colella reminding us that there are more than two pianists on the record and Coates proving to be a good choice to handle the awesome guitar task! It goes without saying that the drum work is tops. 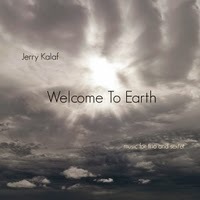 Jerry Kalaf - Welcome to Earth is available on Palm Mountain Records. Listen/buy.